Thanks for your understanding! Good luck with your campaigns. ? Facebook Ads can be a great way to grow your business. You can get the word out about your offerings, grow your list, and even make sales. What you can’t do is figure out which ads work best for your business if you aren’t tracking conversions! First you have to figure out what the “conversions” in your business are. For most online businesses, conversions are usually when a prospect converts to a customer. In other words, when someone buys something from you. You set the conversions in your business, and usually you add them as “goals” in your Google Analytics account. For your Facebook ads, however, it’s REALLY easy to see not only which ads are netting you the most conversions, but how much each one of those conversions in costing you. Go to the Ad Manager and click on Conversion Tracking in the menu on the left. Click on the green Create Conversion Pixel button at the top right of your screen. Other Website Conversions: you can determine something like the time spent on your site, number of pages viewed, etc. NOTE: If you have multiple products or multiple ways someone can become a lead that you want to track with Facebook ads, you need to set up individual conversion tracking for each one. For example, if this ad campaign is focused on building your list using a free webinar as your piece of opt-in content, the conversion you need set up is just for that free webinar. If the conversion you’re tracking is a purchase, add the value of that purchase. If you have an approximate value that you’ve identified per lead, add that. Your pixel needs to go on the “thank you” or “success” page of the conversions. You know how when you buy something online or sign up for someone’s newsletter, you get directed to a page that says “Thanks for your purchase!” or “You’re now signed up for our newsletter!” That’s the “thank you” page. You should have one set up for each of your conversions. 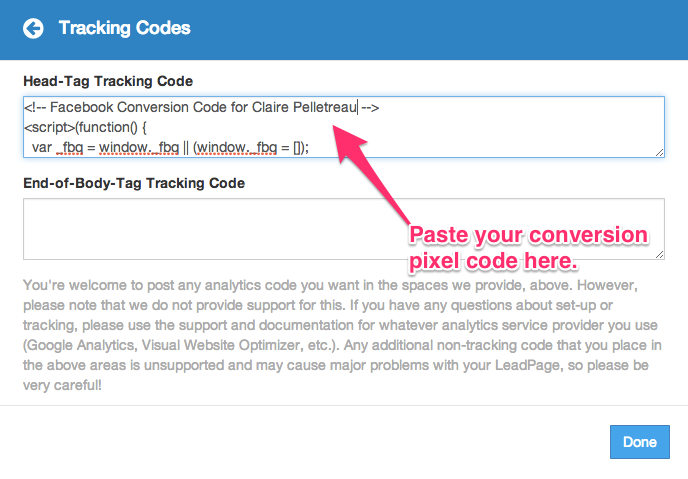 Check the box, and copy and paste your conversion pixel code into this space. Test that your conversion tracking is set up correctly by visiting your thank you page in an incognito window of your browser (right click on your browser icon and select “incognito” or “secret window”). You know you placed the pixel correctly if it shows as Verified in the Ads Manager. Go to your list of pages you’ve created by clicking here. Find the thank you page you made for this conversion and click the blue “Edit” button on the right side. 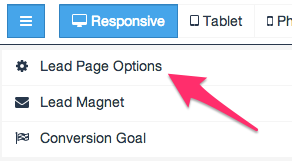 Click on Lead Page Optins in the left menu. Select “Tracking Codes” from the options on the pop-up. 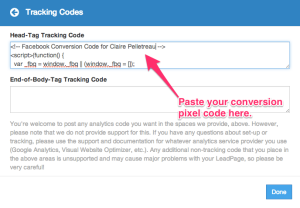 Then paste your conversion pixel code in the box below Head-tag tracking code. Click “Done” and then save your page. DONE! Now YOU’RE tracking conversions. Got questions? Running into some technical difficulties? Let me know in the comments below and I’ll do my very best to help you sort ’em out.